On March 29, 1769, Ann married John James Bleecker and moved to Poughkeepsie, New York. 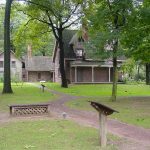 John gave up the practice of law and took up agriculture in 1771, when they moved to his country estate in Tomhannock, a secluded village on the frontier about eighteen miles north of Albany. The house commanded a beautiful view of a fine garden filled with flowers and fruit trees and the waters of the Tomhannock River. of that solemn ridge of pine. 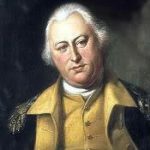 In summer 1777, British forces under General John Burgoyne invaded New York from Canada. In response, John Bleecker joined the New York Militia. Terrified by the news that the enemy were close to the village, burning and murdering everything in their path, Ann fled southward toward Albany with her two daughters, infant Abella and 6-year-old Margaretta, and one servant. The roads were crowded with carriages loaded with women and children; distress and weeping were everywhere. Ann found a place for her children a wagon, and she made the journey on foot. But when she reached the place where she hoped to find friends, none were there. She wandered from house to house, and at last found a place in the garret of a rich acquaintance, where a couple of blankets spread on boards served as a bed. Bleecker’s infant daughter Abella was taken ill and died of dysentery. Bleecker continued her journey and was joined by Ann’s mother in Red Hook, who also died on the journey. Her spirit fled and left me ghastly clay! After Burgoyne’s surrender on October 17, 1777, Ann Bleecker, her daughter and sister Caty Swits (all that remained of the family) set out for the return trip to Tomhannock. Unfortunately, her sister died during the return journey. With the deaths of her mother and sister, every generation in Bleecker’s supportive circle of women had been devastated. 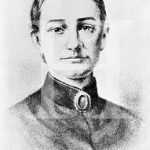 Her husband continued to serve in the militia. From that summer in 1777 until her death, Bleecker suffered from intense bouts of depression and maternal loss figures prominently in much of her writing. In 1779, she was forced to flee with her surviving daughter to Albany again. Through it all, Bleecker continued to write. Her mode of expression was influenced heavily by the eighteenth-century British cult of sensibility, and she wrote in the mannered language of feeling popular in fiction at the time. She is said to have possessed a considerable share of beauty, with a tall and graceful figure. Her letters describing the scenes around her show her ardent and poetical temperament. In August 1781, while her husband was assisting in the harvest, he was taken prisoner by Loyalist forces. His wife abandoned herself to hopeless grief and suffered a breakdown. While her husband was shortly released, she never fully recovered from the shock, and her writings from her final years of life are melancholic and bitter. 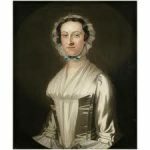 Ann Eliza Bleecker died November 23, 1783, at Tomhannock at age thirty-three, leaving behind manuscripts of poetry and prose she apparently never intended to publish. She was buried in the cemetery of the Reformed Dutch church in Albany. Bleecker never published anything in her lifetime. Instead, she enclosed her numerous poems and narratives in letters that she circulated among a small group of family and friends. After first appearing in The New York Magazine in 1790 and 1791, a significant part of Bleecker’s work was published by her daughter, Margaretta Bleecker Faugeres, who was also a writer and poet. Margaretta edited her mother’s writings and added some of her own poems and essays to a collection entitled The Posthumous Works of Ann Eliza Bleecker, in Prose and Verse, which included thirty-six poems, twenty-three letters and an unfinished short historical novel, The History of Henry and Ann. Her fictionalized Indian captivity narrative, The History of Maria Kittle, was possibly the first American fictional account focusing on Native Americans. It contains many graphic scenes of violence, and Native Americans are described as terrible savages who cruelly kill babies and women, and tells the story of Maria’s journey as a captive. Indian captivity stories, such as those of Hannah Dustin and Mary Rowlandson, were tremendously popular in the late eighteenth century, and Bleecker’s fictionalized account invigorated the genre. But by the end of the story, Maria gets rescued, and the real emotion comes out as three women in the story tearfully recount their stories of maternal loss to others. This story has many similarities to Bleecker’s own experience with the death of her own daughter as a result of fleeing from the British Army. In telling her tale of loss, Bleecker hoped to help women overcome their tragedies. Yet these stories also helped foster racism toward Native Americans. Bleecker’s writing was exciting for the time, and her sense of style added dimension to a new type of novel: the didactic novel, the intention of which is not to entertain, but to teach through the use of a moral or a theme. Some of her stories are also epistolary: structured as a series of letters to her half-sister, Susan Ten Eyck, in which Bleecker interrupted the narrative to comment on the action and address Susan directly. 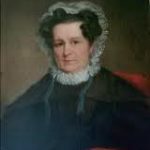 Ann Eliza Bleecker’s pastoral poems exemplified a new style of American poetry, and due to her experience of the American Revolutionary, a new sense of national identity. Pastoral poetry refers to rural subjects and aspects of life in the countryside among shepherds, cowherds and other farm workers that are often romanticized and depicted in an idealized manner. These poems conveyed both the beauty of the New York countryside and the horrific impact of war, suffering, death and destruction. Because Bleecker was writing from the interesting perspective of a terrified young mother, her articulate depictions of the Revolutionary War are still read by historians today for their vivid depictions of war on the western frontier.